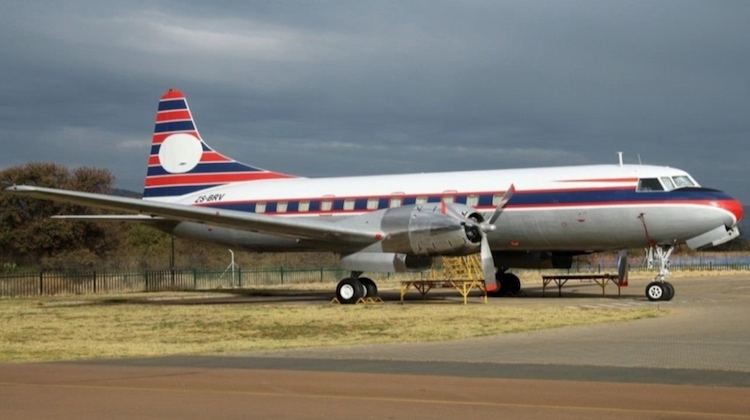 The two highly-experienced Australian pilots of a crashed Convair CV-340 did not follow the prescribed checklist procedures when they discovered an engine had caught fire, a South African Civil Aviation Authority (SACAA) preliminary accident investigation report says. 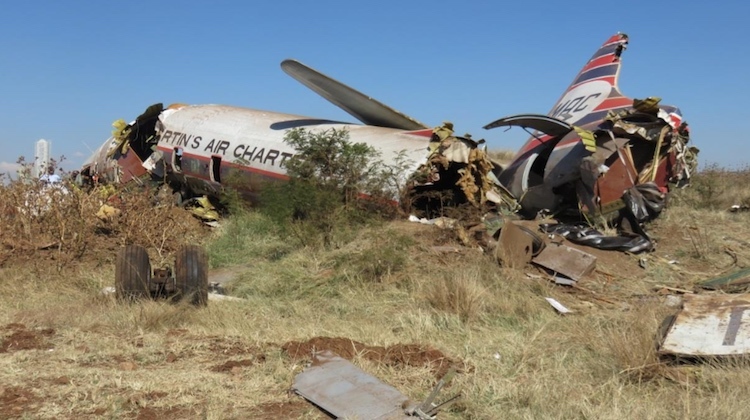 Convair CV-340 ZS-BRV crashed shortly after takeoff from Pretoria Wonderboom Airport, South Africa on July 10 this year with 16 passengers, two pilots and a maintenance engineer on board. The South African maintenance engineer died in the accident, while the Australian pilots, one current and one recently-retired with Qantas, were seriously injured. The preliminary report published on August 12 said the aircraft “experienced a left engine fire after rotation during takeoff”, before striking powerlines and colliding with a factory building. On the day of the accident, the aircraft was conducting a scenic flight from Wonderboom to Pilanesberg and return. Those 19 people on board comprised three Australians as well as three Dutch nationals, 12 South Africans and one Zimbabwean, the SACAA said. The SACAA said recovered GoPro video footage from the cockpit showed the captain was the pilot flying, while the first officer was doing the radio work. The footage also showed the licenced aircraft maintenance engineer (LAME) operating the engine controls. Further, “during taxi, takeoff and flight, until moments before the crash, one of the passengers was seen standing in the cockpit area behind the LAME. “The GoPro also shows that the pilots were not sure if they had retracted the landing gears, as they can be heard asking each other whether the gears are out or not. It also shows that though the pilots and LAME were informed of the left engine fire, they were asking each other which engine was on fire,” the preliminary report reads. 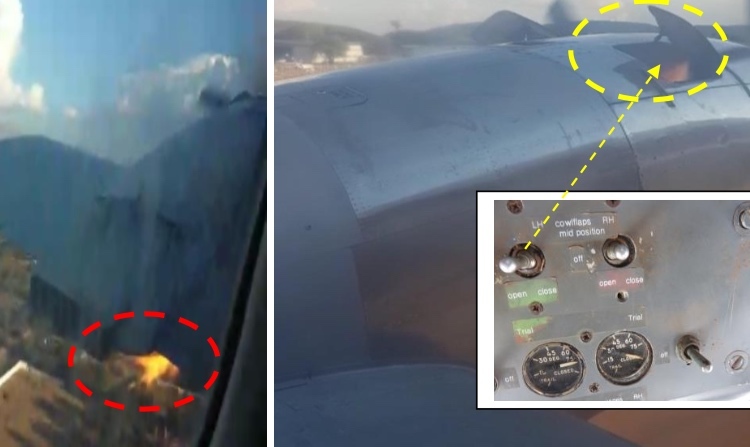 The GoPro footage also showed that “at no stage did the pilots or the LAME discuss or attempt to extinguish the left engine fire, as the left engine fire extinguishing system was never activated”. d in the aircraft flight manual (AFM) were not followed after the crew was made aware that the number 1 engine had caught fire. The scenic flight took place shortly before the Convair, which was built in 1954, was due to be ferried to the Aviodrome museum in Lelystad in the Netherlands. It had been donated to the museum by South African travel company Rovos Rail. The two Australian pilots, Ross Kelly and Douglas Haywood, were members of the Illawarra, NSW-based Historical Aircraft Restoration Society (HARS), and had flown HARS’s own Convair 440, which had also been acquired from Rovos Rail, from South Africa to Australia in August 2016. However, HARS had no involvement with the accident aircraft. The preliminary report noted the aircraft was certified for operation by two pilots and it was “not clear why the LAME was allowed to operate the engine controls during the operation of the aircraft”. “The representatives of the current owner confirmed that in all the previous flights undertaken, the LAME was always seated with the crew and allowed to control the engine controls,” the preliminary report said. The damage observed on the propeller at the crash site was “indicative of damage caused during rotation of the propeller that was not turning at high power”. Further, the exhaust tubes were still secured on the centre section of the wing, while the exhaust exhibited damage by inflight fire and signs of overheating and discolouration. The preliminary report noted Pilanesberg had been closed to fixed-wing aircraft on that day due to runway construction work. However, the crew and Wonderboom air traffic control were unaware of the notice to airmen (NOTAM) published by Pilanesberg Airport about this. The preliminary report said documents and licences made available to the investigation team indicated only one of the pair was rated on the Convair. 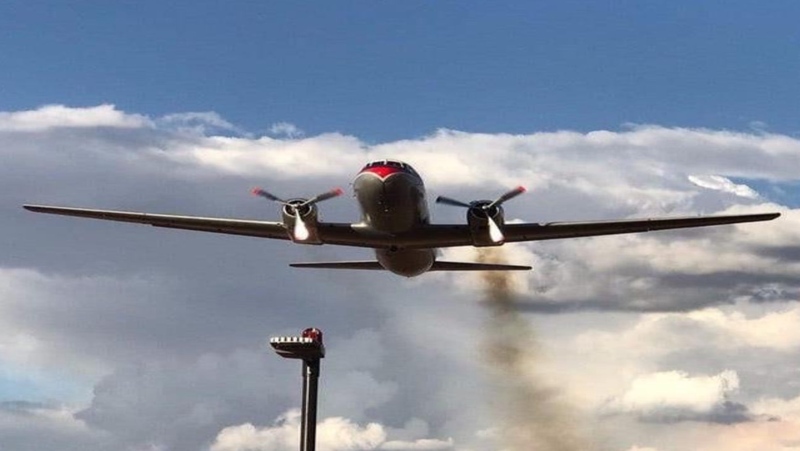 “The captain had a valid Australian air transport, commercial and private licence and he was type-rated on the aircraft (Convair 340/440),” the preliminary report said. The preliminary report said “crew resource management in the cockpit was found lacking”. The investigation is continuing. The investigation team includes representatives from Australia, Canada, the Netherlands and the United States. “As the investigation is on-going we will be looking into other aspects of this accident which may or may not have safety implications,” the preliminary report said. QANTAS may be keen to distance themselves from these pilots. For a pilot not to be type rated, yet occupying a control seat in flight acting as F/O is quite reckless. I’ll tell how keen Qantas is to distance itself from these pilots. They have just medivaced one to Australia at no charge and will do the same for the other in about two weeks. They flew family members back to Australia at no charge. They arranged for family members to be put up at the Qantas crew hotel in Joburg at no charge for as long as they needed (well over a month so far) and much more… yeah, really keen to distance themselves. As to the interim accident report it’s riddled with errors of fact. Let me me give you just one. The claim that the co pilot was not rated on the type is simply not correct. I could go on but the full truth will out in due course. Dan is 100% correct. These pilots are easily two of the best pilots in Australia, legends in aviation and highly (if not the most) experienced in this type of aircraft. Qantas have been nothing but supportive of the pilots and families. Also true, the report is riddled with errors. The FO WAS in fact rated, and the LAME was operating the controls because that’s what they do in such a situation. To back Dan up further, the truth will definitely be out in due course. Do not make assumptions based on paltry facts, especially when the pilots have not even been interviewed yet. The engine cowl flaps are wide open on takeoff. That made a bad situation much worse from drag. If these are good pilots in Australia, well, they were terrible ones in South Africa on this day. Without knowing the full details yet, and of course as mentioned before having not interviewed the pilots, you can’t speculate as to why this was. Probably best not to make assumptions, particularly on the skill-set of these two pilots, Desitter. I’d also note that considering there was only one fatality that day, they were FAR from “terrible pilots”that day. I’d prefer the term outstanding. They saved a LOT of lives that day champ. This was a preliminary report that was released, and the pilots have not even been interviewed. Extremely unfair to be publishing this article. with such paltry facts. Agreed. Seemimgly the basis of evidence thus far is about some Go Pro footage. My main concern is the guys themselves and the passengers. Are they recovering ok does anyone know? Footage that won’t be released. Yes. One pilot is back on home soil, the other shortly. Another published copy of this report states that 4 people in the factory were also injured, one fatally – if so then I think that this AA article could have included that fact. Also the quoted reference to “landing gears (sic)” in the report seems to indicate that this very preliminary indeed. There were no fatalities in the factory on the ground. It was incorrectly reported. The preliminary report, as mentioned above, is also full of errors. I fail to understand how any pilot / Captain would alow and asume the responsibility of F/ O not rated on a comples turbine. There for, I am sure the S.A CAA need to review and apoligise if they are incorrect with a presumptuous report. I don’t know what a comples turbine is but I think you meant complex. 240 is not a turbine. I thought Australian Aviation Magazine would have a bit more professionalism and credibility to post this. It’s not AA’s fault. They are only posting the interim report. At least it’s news. It’s not their fault the report is a bit poor. Considering the engine encountered trouble during the takeoff roll, it seems inconceivable to blame the pilots for not following a check-list, when it would surely be obvious that all attention would be diverted to trying to maintain flight and effect a landing. For example, what good would extinguishing the engine have done? Would that have saved the flight? The report seems entirely critical, without offering any suggestion that had the pilots acted differently, the flight could have been saved. I think I’ll wait for a full, and slightly less biased report. Absolutely. Their priority was to control the plane and avoid crashing into the houses below, which they did. Best to wait for the full report.